Holiday.gr - Lindos, a trip to a myth! Lindos is 50km south of the town of Rhodes. The settlement keeps the colours and atmosphere of another era. Romance is everywhere in the village and enchants all visitors. The architectonic structure of Lindos, with traditional houses has absolute symmetry in the masonry materials. 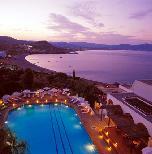 The famous mansions of Lindos with the date of construction engraved on the outdoors attract visitors. Some of these houses today operate as luxurious rooms to let, others have turned into restaurants and coffeehouses, while there are some passed from generation to generation and still host the descendants of romantic sea captains. 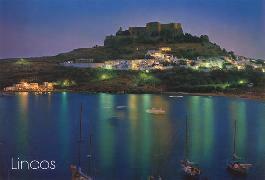 In the paths of Lindos you will find luxurious restaurants, bars and beautiful gift shops. As for Lindos’ beaches, two shores in the same Gulf, full of umbrellas and sun beds, are with the biggest tourist development in the island, very close to the settlement are waiting for you. The sea is shallow with sand and very clean. In the gulf of Agios Pavlos with the great beach you will see a church dedicated to Apostle Pavlos. According to tradition, it was built in the place where Apostle himself spoke about Lord, while visiting the island. On the top of the hill you can see the famous Acropolis of Lindos and the remains of Lyndia Athenas’ temple viewing at the sea. Been to Lindos ? Share your experiences!